Saddleseat is often grouped with English classes, although there is quite a bit of difference in the two styles. Most English classes are of Huntseat - Hunter on the flat, over fences, Hunter Hack, Equitation. This is the most commonly seen class with the round-flapped English saddles, breeches, high boots and hard hats. Saddleseat evolved in a way from the English Pleasure style, but now is associated with classes for Gaited and Park type animals. Gaited mules and donkeys are those which perform a specific intermediate gait other than the normal walk, trot (jog) and canter (lope). These may include the rack, stepping pace, running walk or singlefoot. In the horse world, only gaited breeds capable of exhibiting the flashy Apark action@ compete in Saddleseat classes. 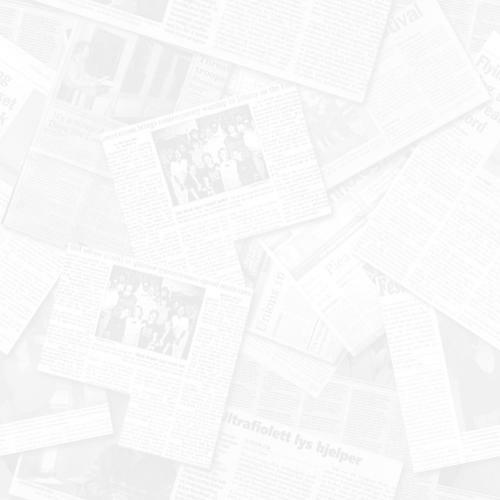 Animals with more limited range of Aupwards@ motions are not seen in these classes. Saddlebred, Tennessee Walkers, Spotted Saddle Horses, Morgans, National Show Horses, Arabians and similarly gaited ponies are the most popular breeds in this area. Breeds such as drafts, stock types (Quarter Horses) are not seen here. Saddleseat is meant for equine with a different, uplifted action. 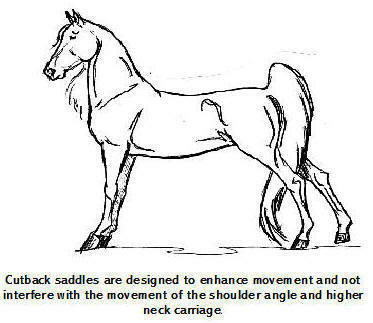 The conventional Huntseat saddle was not appropriate nor allowed the demonstration of the high action which originates in the shoulder. The Cutback (Saddleseat) saddles evolved through changes to accommodate the action of animal. The front of the saddle is Acut back@ in an open U shape at the withers to allow, not only for the action, but the generally higher head carriage and neck set of the gaited types. The flaps are long and cut straight down from the pommel, not shaped and rounded with knee rolls as in many Huntseat and all purpose type saddles. With the cut back area, the saddle is also set farther down the animal=s back. The girth runs not behind the foreleg, but more around the ribs of the mule. When the mule or horse is in full action, the rider is behind the motion. This gives the smooth ride so often associated with gaited and high action breeds. The rider is not caught up in the action (being forced to work with it by posting a trot or enduring at a jog or sitting trot), but can sit on the midback, in a spot that moves very little. This also gives the impression that the rider has very little to do but sit in the middle and steer. Being behind the motion, the stirrup length is longer than a Huntseat situation where the heel, hip and shoulder are in a straight line. The legs tend to look like they Adangle@ in Saddleseat and leg aids are usually not used in this riding style. Cues through the bridle and occasional whip aids are used instead. Gaited animals, with the exception of the Racking or Tennessee Walking mules, are usually show in full Double Bridles. These have two headstalls and two bits, the curb and the bridoon (snaffle). 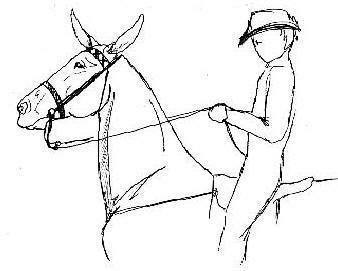 Occasionally, a Pelham bit may be used, which is a specially designed bit that allows the use of double reins and acts the same as the full bridle. Walking and Racking mules are shown in long-shanked (and usually broken-mouthed) Walking bits a kind of curb. Headset is achieved with the curb and the control is through the snaffle. The snaffle reins are uppermost on the bridle, but the reins are crossed on the neck, making the curb uppermost in the rider=s hands. The rider keeps he/her hands higher in comparison with the other riding styles. 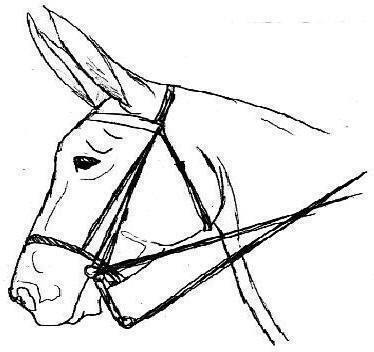 In Huntseat there should be an unbroken line from the mule=s mouth to the rider=s elbow. The wrists should be straight and not broken over. Saddleseat riders carry their hands higher at chest level, elbows down and writs turned (broken) to hold the two rein sets. All saddles come in a variety of sizes. The question of AWhat size saddle do I use? @ has to be answered in two ways. First, the seat size must be appropriate to the rider. The seat is measured from the forward screw to the middle of the cantle. Sizes range from a 15" child=s saddle to a 19" for a large adult. The rider=s crotch should be clear of the pommel (cut back area) and their buttocks should fit comfortable in the swell of the saddle. Parts of the rider overhanging the pommel mean the saddle is too small for the rider - a problem with larger people who enjoy riding! The saddle must be fitted to the mule also. Mules have lower withers than horses and most cut-back saddles are designed only for horses. The width of the saddle tree is the main concern. A saddle that is too wide will ride forward, a problem especially noted with some mules. Too narrow a tree and it will pinch the wither and back muscles. Too check the fit of a saddle, make sure the gullet (open area under each saddle) does not touch the animal=s back. The gullet is there to keep the weight off the mule=s spine. If the gullet touches the mule the saddle is far too large. To test how much of the saddle is actually resting on the mules back, apply baby powder over his back. Set the saddle (without sliding it around) onto the mule=s back in the correct position. Then lift it directly up and off. The areas where the saddle touched will have less or no powder. This is also a good test to see if an older saddle has twisted unevenly and might need re-stuffing. Overall, the gaited mule and rider should present a picture in the show ring of gliding motion with a smooth and comfortable trip for the rider with a polished look of Country Elegance. Saddleseat tack is designed to accomplish this picture.